Hyattsville CX took place October 11, 2009, at Magruder Park in Hyattsville, Maryland. The course featured fast power stretches joined together by technical bits and off-camber turns. Big engines could gap the competition on the straights, those with exceptional skills could catch back up in the technical sections. We caught up with podium finishers to see how they tackled the day. Magruder Park is predominantly flat. How did you approach this course as opposed to a hilly race like Kelley Acres? Did the terrain affect your race? 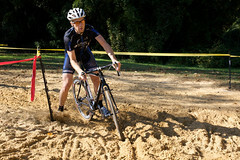 Tim Brown (The Bike Rack, 1st Place Men’s 3/4): There are different ways to approach ‘cross races? I thought you just rode as hard as could for 45-60 minutes. Joking … kind of. I’m a roadie so as with any ‘cross race I do better in the straights than the turns. Thankfully there were plenty of straights where I could make up all the time I was losing on the technical sections. Adam Driscoll (Adventures for the Cure, 2nd Place Men’s Elite): Terrain definitely helped benefit me as I am a power rider and still working on my technical skills. My skills are getting better but just not all there yet. Once I saw Dave Fuentes was in the race I knew I was going to have to use everything in my tank to stay with him on the power sections and rest on technical spots. 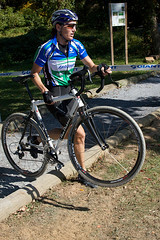 Christine Wehlburg (Team Latitude/ABRT, 1st PlaceWomen’s 4): Joe Jefferson at BCA CX, “and here’s Dr. Wehlburg. Where’s a good crit when you need one?” I have a ways to go in the cx technical skills department especially downhill. However, Kelly Acres improved my confidence immensely and my reward was the flats of Magruder Park! Morali kickin' it in the pit. Jay Morali (C3-Athletes Serving Athletes, 2nd Place Men’s Masters 3/4): I just approached it like every week…ride as hard as I can and try and stay upright. I really liked the course. It had some sections that really suited guys who have a big motor but it was just technical enough to allow guys with good skills to hang around. It made for some great racing! Kenneth Morris (Winchester Wheelmen, 3rd Place Masters Men 3/4): After pre-riding the course I knew it was going to be a steady effort course. My goal was to keep my cadence high and leg stress low. The terrain was unexpectedly challenging. Very few places you could ease up. What was your favorite part of the course? Was there a feature you could have done without? Tim Brown: The spiral section was fun… although I nearly crashed and lost the race there with two laps to go. I could have done without that rut/pothole-filled section after the barriers. It beat me up pretty good each lap. Christine Wehlburg: I really liked the off-camber alley oop after the first barriers past the playground. Reminds me of places we would ride our ten speeds through backyards as kids. Least fave part was that fast turn on the baseball field. Slowing down would have been a good idea. Kenneth Morris: I loved the death spiral! It was a unique and confusing feature. On the first lap I was wondering when I would hit the guys behind me. After going through it a couple of times I mentally referred to it as the Yin and Yang section. The only part I would change is the 90 degree turn into the sprint. I am not that good at short sprints. Adam Driscoll: My favorite part of the course for sure was the spiral of death. Once I did it a few times you could really drive through it and it was fun. The part that was hard for me was right before spiral where you had three hard 180 degree turns on a hill. Seemed like it always took me several extra seconds to get through there. Jay Morali: I thought the overall flow of the course was great. The sand pit was tricky. Joel Steen: favorite: SPIRAL OF DEATH! Take us through your pre-race routine. Did you warm-up on the course, use a trainer or ride on the road? How did you fuel up? Tire choice and PSI? Adam Driscoll: This race was a little different since it was so close I decided to go to church first then head to race with wife and two puppies. I didn’t get there until close to 1:45 so I didn’t have a lot of time to warm up. For my warm-up, I rode on road for a short time then did the course 1.5 times right before the start. I had lunch around noon which was PB and Jelly with apple. My blood sugar was good the whole race so didn’t have to worry about getting food in me. PSI was 40 and wheels were Reynolds DV tubulars. Wehlburg navigating the natural barrier. Christine Wehlburg: For now, my fitness isn’t the limiting factor. It’s my technical skills. That means I can’t pull a Ramon Benitez and come screeching into a race with 15 min to spare before my start and expect to do well. I need to arrive early and get on the course to warm up. Hyattsville was the first time I did that. I got in 3 laps on the course thanks to lil’ Belgians. I can imagine, if the weather is messy, my best option may be the trainer. I’m still learning about tire pressure but I don’t leave it up to Dave [Fuentes], for sure! He has a real mental block about riding a bike with any squish in the tires. You heard it first from Dave. He gets up and makes me breakfast most mornings. Race day we like eggs and pancakes. He lets me help with the flapjacks. Banana one hour before race time and a GU at 15 minutes prior. Lots of water beforehand. Kenneth Morris: I always try to warm up on the course after riding around the area for a while. I have team mates racing in the CAT4 race so I limit my warm up time a little and try to watch them race. I eat early in the AM. I Like to race on a settled stomach. I guess I bring that in from my running days. I used the same tubulars that I did for Kelley Acres (Grifo). I ran 30 lbs. air pressure mainly for riding comfort. Joel Steen: Coffee at home, breakfast at Micky Ds … sausage mcskillet, hashbrown and small OJ. No idea on tires and psi (borrowed bike). Ryan [Douglas] set me up good though. The tires felt flat, but never bottomed out or actually went empty. Tim Brown: I live in DC so I was lucky enough to be able to ride out to the course for a bit of a warm up. Besides that, I just did a couple laps on course and then spun around in the surrounding neighborhoods. Food-wise– cereal for breakfast and then a bar/gel about an hour before the race. I was running Continental Speedkings with way too much air. I was bouncing/sliding out all over the place … but hey, at least I didn’t get a pinch flat like at Ed Sander. What was the decisive moment in your race? Is there anything you would have done differently? Tim Brown: Well my race came down to a heads up sprint with R1V’s Jesse Leifert… so I’m not really sure if you could say there was a decisive moment. Maybe being first wheel through the last turn? Kenneth Morris: I knew that Jay Morali would be competitive for the win so I tried to match his pace. Once we broke away from the field a bit I considered trying to work with him to try and catch the leader, but I have a tendency to overdo it on the front. I’ve been working on that one and hope to improve as the season progresses. Adam Driscoll: Most decisive moment was definitely with about two laps to go I dropped my chain over the 4 small log jumps. This was all Dave needed to gap me and I was not able to catch back on. I came off my bike a little differently and looking I should not have done that. I unclipped my right leg early and sort of came into the turn like that. Somehow that forced the chain to bounce around and off it went. Jay Morali: I was chasing Stephen Robinson for a couple of laps. He would pull away on the flats and I would make up a little ground on the technical sections but finally the elastic broke and I had to hang on for dear life for 2nd while Kenneth Morris chased. Joel Steen: When the Copi guy [Kevin Burke] crashed in front of me on the last lap and Travis [Coleman] got a big lead. I should have pressed it harder a lap earlier when Travis and I traded attacks on Copi a few times. What is your training schedule like during the week? Has it changed at all since the beginning of ‘cross season? Tim Brown: Well now that is a secret. I will tell you that I am religious about my Friday SAYG rides though. Christine Wehlburg: I ride when I can, run when I can’t ride and do yoga when my back tells me I should be doing neither. Kenneth Morris: I train six days a week except when there is a race. I mainly train with my teammates doing intervals and steady states. Mondays are recovery, Tuesdays intervals, Wednesday steady state, Thursdays hard effort, Fridays off, and Saturday-Sunday long road rides. As the daylight leaves the trainer and headlights come out. Adam Driscoll: We are not able to train as much during the week now since it seems like we are always recovering from last race and getting ready for next race. I still seem to at least get one good workout in on my road bike or cross bike per week though. Before the season started I was getting 2-3 workouts out in per week. Joel Steen: I try to get to Hains Point on Tues/Thurs for ~45min of the noon ride. What is one part of racing (specific skills, fitness, mental focus, etc.) that you have tried to improve coming into the season, or even as the season progresses. How have you gone about doing this? Tim Brown: Haven’t really focused on any one thing. I just try to race / ride as much as I can. Christine Wehlburg: I get little panic attacks going down steep inclines. So I don’t avoid races like Kelly Acres and my skills will improve. Kenneth Morris: My glaring weakness is remounts. I seem to get through the obstacles quickly, but I give time up getting back onto the bike. I also seem to have a little trouble setting the pace when I am in the lead. I would have to say these two problems occupy allot of my mental prep time. I practice the barriers ad nauseam and work on my race pace. Adam Driscoll: The part I have been really focusing on is the skills piece. Cornering and just being very confident making sharp turns. Still sort of new to cross and I have just really been working on that. Hyattsville was the first time I did not stutter getting back on bike after a dismount, so I was extremely happy about that. Race prior I was about half and half so I think I finally conquered it! Jay Morali: Rest and Recovery! Joel Steen: I’m trying to get my own bike! 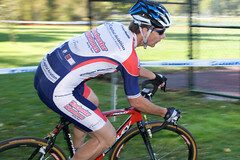 Tim Brown: Thanks to the Bike Rack and District Velocity Racing. Also a big thanks to RV1 for putting on a fun race. Christine Wehlburg: Shout out to Route1Velo and Arrow Bicycle for my first set of (sweet) race tubulars (road or cx). Kenneth Morris: I have to give credit to my mates: Jon, Erik, Eric, and all the Wheelmen. We have only been a team for two years and our successes are tremendous. Adam Driscoll: Just a big shout out to my wife and teammates. All the support they have given for hanging out for the A race to cheer me on. It’s a long day when you race first and you hang around all day to watch my race. I appreciate it greatly! Makes a big difference in how I perform. Just knowing I have people hanging out to watch. Jay Morali: Scott Cernich and all that helped put on a great race…thanks! Joel Steen: Thanks a TON to Ryan for letting me borrow the Soma!